Good lord! Leviim has been having a great week. I would love to tell you all about it, but… Oh wait, that’s why we write this blog! I am gonna tell you all about it. It all started Thursday night. The boys had a surprise peulat erev (evening activity): going to see a Fishercats game! Though the league was only AA, the experience was A+. 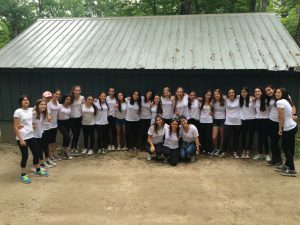 The girls stayed in camp and had an even greater time during their special peulah as they broke boundaries with each other and got to know one another on a deep level. Suffice it to say everyone felt great. Friday was a great day of french toast st icks and freedom as Shabbat approached. We spent the afternoon preparing for Zimriyah (our camp-wide singing competition that is happening this Thursday and that you all should come to!!). Once again the subtle aura of Shabbat began to seep into our souls, as if by osmosis. To even put any more of it into words would betray the experience, so I’ll just say that we looked at each other as if in a new light, not as friends and neighbors, but as one unit and one people. Every action had a new significance, every breath a new lesson. On the day when the universe rested, all beings were satisfied, even satiated. It is a day that defines our culture, our community, and ourselves . As Shabbat came to a close, our heroes finished their week of being meltzarim (waiters for the camp at meal times). 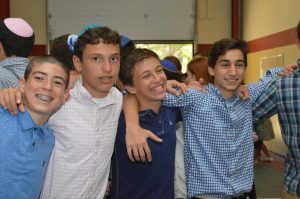 Though it was only year 2 of our heroes being meltzarim at camp, they were so efficient, you might’ve thought it was year 1000. Afterwards, the champions we know and love got to spend some time with their Kerem (CITs and oldest aydah (age group) in camp). Sunday was quite a day. I saw free swim, I saw Zimriyah practice, and I even saw a peulah chinuchit (educational activity) where we learned about stereotypes and perspective. The theme of the summer, kol Yisrael arevim ze b’ze (all of Israel is responsible for each other) penetrated the hearts of the chanichim (campers) as we discussed how we see others and how others see us. The depth of learning and the fun were pretty much tied, so I’d call it a success. Enter Monday. We found ourselves with grilled cheese sandwiches in one hand and sports equipment in the other (for dodgeball and stickball to be specific), singing for practice, and jumping for joy. The night was filled with an aydah-wide boys vs. girls football tournament, which was honestly maybe a little too much fun. With fatigued legs and fresh smiles, the aydah fell asleep in their tzrifim (bunks), dreaming up the ways they could make the most of this month’s end.